Free WordPress Theme "Lucky Guess" is Fresh and Stylish – Perfect for the Ultimate blog. Just in time for St. Patrick’s Day – I give you Lucky Guess. Lucky Guess is a semi-magazine / semi-personal blog styled theme for WordPress. It packs a set of nifty features that you will find useful, especially for newer blogs. Don’t let this baby fool you – it may not be real fancy, but it will surely dress up your blog! And it loads hella fast – the theme files are minuscule in bytes! 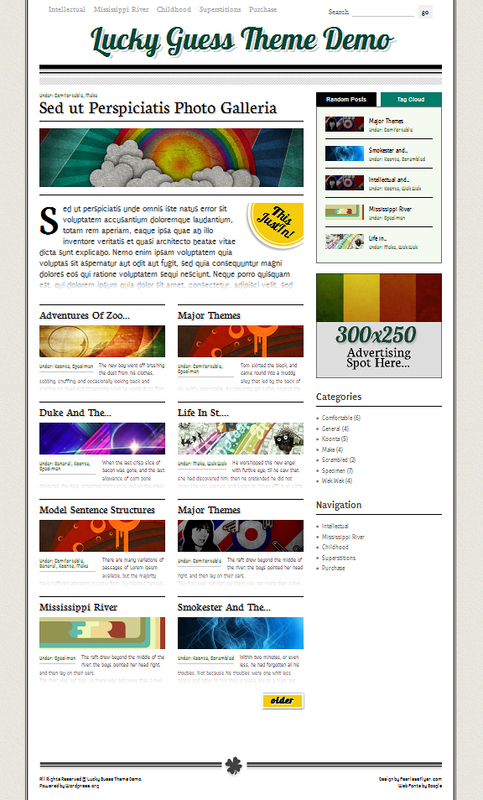 The theme supports WordPress 3.0 featues such as post thumbnails, wp-menu system as well as widgets. A custom jQuery Tabbed Container is embedded in the sidebar. This showcases your posts which is randomly ordered, as well as post tags in the second tab. Custom styling for your photo galleries, with a built in lightbox functionality known as “Prettyphoto” – courtesy of No Margin for Errors. So all of the images linked to another image will pickup this plugin by default. I’ve implemented plenty of CSS 3 techniques in this theme. You will notice both loud and subtle text shadows in the headings, text orientation and box gradients. I’ve used plenty of Google fonts – which renders faster than the popular Cufon. The theme is tested to work in IE 7, 8, Safari, Chrome and of course Firefox. So what now? If you run a WordPress blog and need a real make over – this might be the theme for you. Install this puppy and you’re ready to go. I’ve mentioned that this theme is ideal for new blogs – only because its easier to attach post thumbnails as you create new posts. Although Lucky Guess will still work with or without thumbnails. So what do you say? Download the theme from this link. Also, more documentation can be found in these series of posts. Hi Michael. I love this theme – thanks so much for offering it for free! I’m not really technically minded, and I’ve not been able to work out what to do with the ad on the side bar. I don’t see it in the widgets, so how can I 1) either upload an ad, or 2) disable it? im sorry Mandy, but that ad is still embedded hard code in the sidebar.php. I will update this theme real soon to have theme options like the rest of my themes. Hi man! I wonder, Can I change footer’s words? So; I will translate words to my language.Your adse will stay.I will just change words to my language? use post thumbnails. on post edi tpage – see “featured image” and upload an image. Thanks, now it works perfectly! One last question – the reply button isn’t showing up for comments. What can I do to correct this? i believe you have to set that up in the settings of wp. Great job! Do not tell me how to change the output records? I mean that the posts on the main page displayed as a blog, a column with the full text entry .. Thank you for this theme. Like you others, it is really great. I am having a slight issue with the ‘excerpt’ feature. No matter what I try, manually, putting the ‘read more’ page break, cut and paste…nothing is working… Ideas? Thoughts?? Thanks. the read more shortcode will get stripped out when the_excerpt is being called – which what the theme is using. This is to prevent unwanted html from being displayed in the home / archive pages. if you want, you can edit index.php or home.php – look for ‘the_excerpt()’ and change to ‘the_content()’. this will make the read more code work. But it will also show your entire post. How can I add a logo to the header? Hi there, I would like to use this theme, I’m using right now on my dev web site but I can see that there is a problem with special characters which are not displaying correctly. Great theme. I want it to display the site’s most popular posts (not by number of comments, but by hits) and also to not display a thumbnail in the list if there isn’t any. How should I modify the code (it’s the section below, right)? Thanks! I love this theme, but I am running into problems. For starters I am getting the thumbnail and in the “this just in” section, I get the normal image on the home page. Secondly, when I click on a post, I see the thumbnail and a second image in that post. I am sure there is a simple fix. How can I fix these issues? Love this theme, but I cannot find where in the files I can edit or define which category ID shows up for the main “feature” (large) box at the top? Or do I just make a post sticky to have it stay in that spot? Thanks! sorry, i found out the problem, i only need to choose “use as feature pic” when upload, still the thumbnail is not very pretty, i am working on that. It’s so nice I’m sure lots of people using your themes, or even others, would love to use it. Oops, I mean RIGHT side of this page.